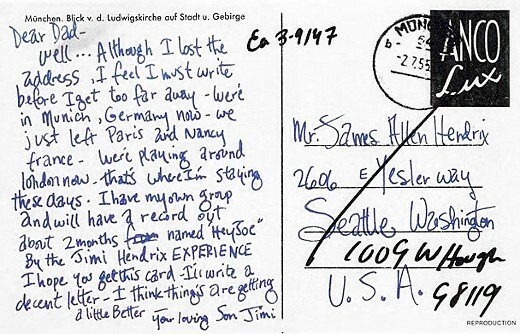 October, 1966: Very soon after forming The Jimi Hendrix Experience, Jimi Hendrix writes a postcard to his father back home in the U.S. and fills him in on recent developments. Two months later — as mentioned by Jimi — the band's first single, "Hey Joe," was released. Their debut album, "Are You Experienced," soon followed; it is now considered by many to be one of the greatest albums of all time. Transcript follows. Image kindly supplied by Jerry.